Politico Europe: “NATO allies extend Stoltenberg’s term as secretary-general” — “NATO Secretary-General Jens Stoltenberg is not obsolete. “The 29 allied countries on Thursday extended Stoltenberg’s term as NATO’s top political official for two more years, until September 30, 2022, ensuring a measure of stability at a time of tension in transatlantic relations and apprehension over Russia’s military assertiveness. New York Times: “Opinion: Trump Aside, What’s the U.S. Role in NATO?” — “President Trump has many bad ideas. Reconsidering America’s role in NATO isn’t one of them. 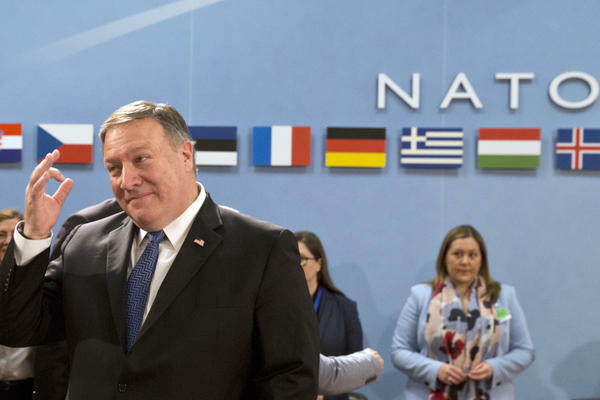 “NATO, a military alliance, was formed specifically to prevent the Soviet Union from dominating Europe, whose principal powers — Germany, France, Italy and Britain — had been so devastated by World War II that they were vulnerable to Soviet coercion, subversion or conquest. NATO also became a vehicle for rehabilitating the Axis powers — Germany and Italy — under the victors’ tutelage. Brookings Institution: “NATO at 70: More than a military alliance” — “The North Atlantic Treaty Organization turns 70 in April. To discuss challenges to and opportunities for the alliance as it enters its eighth decade, this episode features a discussion among a group of leading Brookings experts: John Allen, president of the Brookings Institution; Constanze Stelzenmüller, the Robert Bosch Senior Fellow in the Center on the United States and Europe at Brookings; and Michael O’Hanlon, a senior fellow and director of research in the Foreign Policy Program at Brookings. The Economist: “How NATO is shaping up at 70” — “Reaching 70 is an extraordinary achievement for the North Atlantic Treaty Organisation. Most alliances die young. External threats change; national interests diverge; costs become too burdensome. Russia’s pact with Nazi Germany survived for only two years. None of the seven coalitions of the Napoleonic wars lasted more than five years. A study in 2010 by the Brookings Institution, a Washington think-tank, counted 63 major military alliances over the previous five centuries, of which just ten lived beyond 40; the average lifespan of collective-defence alliances was 15 years. Chicago Tribune: “At 70, NATO is strong — but it must adapt to new demands” — “NATO turns 70 on April 4. That’s normally a good age to retire. But retirement would be a mistake, because the need for the transatlantic alliance remains very real. Russia continues to threaten the unity and stability of Europe, both indirectly and directly. European economic and political cooperation continues to depend on a close security partnership with the United States. And America continues to need its powerful and prosperous allies in Europe to address the many global and geopolitical challenges both face. “Yet, while NATO is still necessary, it is buffeted by the twin challenges of European underinvestment and lack of American leadership. Europe will need to significantly ratchet up spending on defense to counter two decades of cuts. And America needs to stop hectoring its allies and start leading them again toward common purpose. The future of the alliance depends on both.